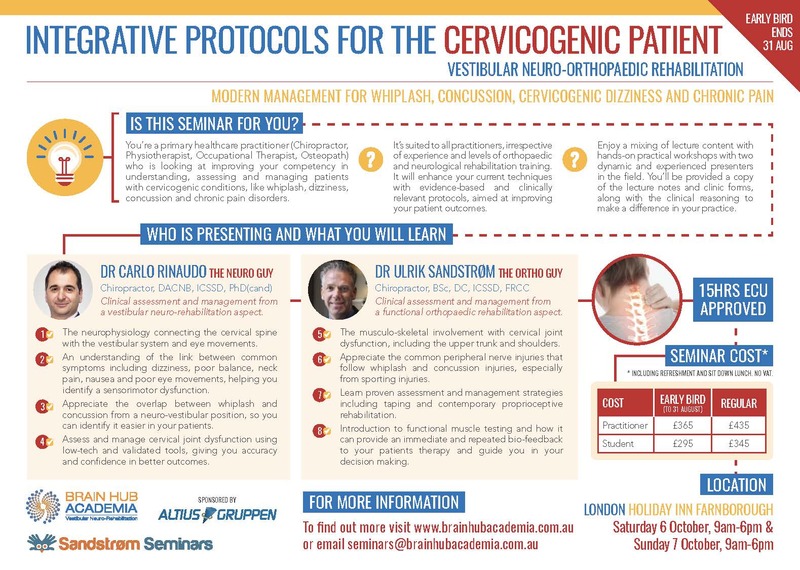 relevant protocols, aimed at improving your patient outcomes. – Enjoy a mixing of lecture content with hands-on practical workshops with two dynamic and experienced presenters in the field. You’ll be provided a copy of the lecture notes and clinic forms, along with the clinical reasoning to make a difference in your practice. – An understanding of the link between common symptoms including dizziness, poor balance, neck pain, nausea and poor eye movements, helping you identify a sensorimotor dysfunction. – Appreciate the overlap between whiplash and concussion from a neuro-vestibular position, so you can identify it easier in your patients. and confi dence in better outcomes. – The musculo-skeletal involvement with cervical joint dysfunction, including the upper trunk and shoulders. to your patients therapy and guide you in your decision making.